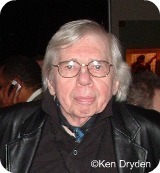 Bob Brookmeyer died in his sleep Thursday night in a hospital near his home in Grantham, New Hampshire. He would have been 82 on December 19. The cause is reported as congestive heart failure. This CD is very much a pre-production sample. Please hold close to your vest. I have been listening to it repeatedly and holding it close, only to learn today that it has been released under the title Standards as an artistShare download and as a CD. The music demonstrates the craftsmanship, wisdom, humor, flair and architectonic mastery of form that make Brookmeyer one of the supreme composers and orchestrators in the history of jazz. As discrete statements, as settings for soloists, and in support of the singing of Fay Claassen, his pieces on Standards are emblematic of the happy place Brookmeyer had reached in a life and career that had many highs but also lows that for a time his music reflected. He once said of the period when he dealt in electronic music and acoustic music that sounded electronic that some of it “could make your teeth hurt.” He worked through whatever led to that, and for the past decade he wrote music that could make you smile, not because it was funnyalthough it could be, in his wry waybut because it was so satisfying. I may write more tomorrow about Brookmeyer and his productive life as a writer and as the standard-setter for valve trombone playing. Tonight, allow me to simply share with you two Brookmeyer moments. Here’s a track from a 1956 12-inch LP, one of his early albums as a leader. This is the 26-year-old Brookmeyer with Jimmy Rowles, piano; Buddy Clark, bass; and Mel Lewis, drums. Moving ahead half a century, here’s Brookmeyer conducting his beloved New Art Orchestra in “Get Well Soon.” The tenor sax soloist is Paul Heller. Thanks for the great post on the great Brookmeyer, a huge favorite since I was a kid in the 50s. Please write more if it strikes you to do that. Bob’s “music that could make your teeth hurt” line was a typically wry Brookmeyer comment. In fact, though, he produced much music of lasting value during that period (the 1980s); I got to play much of it while subbing with Mel Lewis and the Jazz Orchestra. This music reflected his interest in contemporary composers such as Lutoslawski and Earle Brown. One of his crowning achievements at that time was the Lewis band’s MAKE ME SMILE album, recorded in 1982. Its masterpiece is a feature for Joe Lovano, “The Nasty Dance,” that I regard as one of jazz’s greatest long-form compositions. It’s truly an innovative (to use a word much overused in jazz) work. Whenever I play it for students, their jaws drop. This album is hard to find–it was released on LP by Finesse and later briefly on CD by Red Baron–but is well worth the search. So sorry to hear of Bob’s passing. Of all his music my favourite is his playing on the 1961 release Stan Getz-Bob BrookmeyerRecorded Fall 1961, which is one of the most played records in my collection. His own compositions on this album particularly “Minuet Circa 1961″ features Bob at his splendid best. I consider it one of the few perfect albums I’ve ever heard. One of the major figures in 20th century jazz; he’ll definitely be missed. R.I.P. Bob Brookmeyer. — When I was young and naive I only knew about Bob Brookmeyer that he followed Art Farmer in the Gerry Mulligan Quartet. So, I expected to hear the very same kind of quiet music when Bob took Mel Lewis and the WDR Big Band to the Kölner Musikhochschule (Cologne Music College). What I heard was nothing but complicated, contrapuntal charts, and a quite struggling orchestra who obviously had its difficulties to play Bob’s music adequately. The only musician who seemed to feel at home was trombonist Henning Berg. This was the kind of “teeth hurting” music, Bob was talking about. Well, it didn’t hurt, Bob, on the contrary: It proved to me once again the importance of not sticking to the routine, to the convenient if you want to improve as a man and musician. Thanks for helping me grow up, Bob. Bob was a role model, a mentor and a friend. He turned a bunch of arrangers into composers through his work at BMI and he taught two generations of jazz composers to ask “why?” instead of just “what?” His growth process never stopped. As for his less accessible works, he always owned every note he produced and was always up front about the period when he “tried to make your teeth hurt”. Basie and Lutoslawski in near-perfect balance. He was one of a kind. We count on you to add more from all you know and celebrate about Bob Brookmeyer — the man, the achievement, the legacy. I agree with John Bolger about the importance of his work with Getz. My special favorites are his work with Clark Terry — in the mid-1960s, and again decades later with the Vanguard Jazz Orchestra. To pick one of his many deservedly immortal arrangements, I’d choose his “St. Louis Blues” chart for The Vanguard group, when it was the Thad Jones-Mel Lewis Orchestra. That was almost a half-century ago. See the “Brookmeyer Revisited” post above this one on the main page. It includes video of Jones-Lewis playing the “St. Louis Blues” chart. I played “The End” –the 10-minute final track from Brookmeyer’s penultimate album Spirit Music– at least six times yesterday. Each was more satisfying than the one that preceded it, and I look forward to hearing it again after work, this evening. When viewed over time, I think Brookmeyer’s 60-year career path will be recognized as one of the great careers in the history of the arts. And wouldn’t it be terrific if we could just go back the sixty years, drop in on a Claude Thornhill job when Brook was playing Claude’s solo on “Snowfall” (as occasionally he did), knowing he’d soon be joining up with Stan Getz and then Mulligan, and watch it unfold all over again….? Bob was one of the first guys I played “follow the sideman” with as I learned more about jazz. It was quite a journey with him. Definitely a unique voice on his instrument, and so many of you have pointed out his other strengths in arranging, composing and teaching. I enjoyed his rants on politics and the state of things, too, although I didn’t always agree with his assessments or what he thought should be done. It showed a mind that was still “raging against the coming of the night”. I had many older people in my life like Bob who told me to say what was on my mind. He was living proof that you should never give up that right even as you age. There is no question that he must be considered, too, as one of the very greatest soloists – on any instrument – in all of jazz. He’s on that same list: the one that begins with Lester Young and Charles Christopher Parker, and Getz and Dexter… he’s there too.